Everybody knows that when they see a movie from Cameron Crowe (Vanilla Sky, Almost Famous), music will play an important part somehow. Crowe likes to fill his soundtrack with a wide selection of music, typically from the rock world of a few decades ago. Tom Petty, Elton John, Lindsey Buckingham, and an eclectic variety of other artists and bands fill the soundtrack of Elizabethtown, but it feels like Crowe spent more time on the soundtrack of the movie than he did on the script. The same snappy, witty Crowe dialogue is there, but the story itself feels like half a script rather than a whole one. Elizabethtown moves in fits in starts, with long stretches where not much happens. It's a surprise at how mediocre this film is given Crowe's considerable talent. 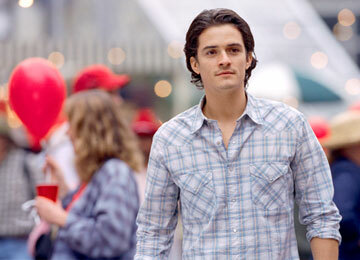 At its worst, Elizabethtown feels like a retread of Almost Famous. A guy (Orlando Bloom, Kingdom of Heaven, Troy) goes on some important life-journey where he meets a free-spirited girl (Kirsten Dunst, Wimbledon, Spider-Man 2) and falls madly in love. This is a huge simplification, but one cannot help notice the similarities between Dunst's Claire Colburn and Kate Hudson's Penny Lane. Only Hudson is a better actor, and Lane was a fuller character. Colburn is a flight attendant that meets Drew Baylor on a flight back to Louisville, Kentucky. Baylor's father died, and he is going to bring the body back to Oregon. They hit it off, but he lies to her about his father's condition. Baylor is in shock not only at the death in his family, but at a spectacular disaster. He spent over half a decade designing a shoe said to revolutionize the industry. The buzz is immense, but within a week, the world will learn that the shoe is a failure and that Baylor is responsible for losing nearly one billion dollars for his company. He was about to commit suicide when he learned his father died. So it makes sense that rural Elizabethtown is the perfect place for him to receive some sort of epiphany. Baylor was never close to his father, and never met his father's side of the family. They are large, loving, and loud. They want to bury his father in Elizabethtown, and object to the fact that Baylor's mother (Susan Sarandon, Shall We Dance, Alfie) wants him cremated. He also begins spending a lot of time with Colburn, whose very presence helps him to forget about his job and look at better things in life. She takes it upon herself to show him some local sights, and in the process they fall in love. Elizabethtown also has a very 'movie' feel to it. The dialogue and situations do not feel as natural as they typically do in Crowe movies. The Colburn character in particular is too much of a movie creation than a believable character. The dialogue is forced, and alternates between typical dialogue and varying attempts at humor. Extended voiceovers by Bloom, who serves as the narrator, also feel forced. Bloom is a handsome actor (as legions of teenage girls can attest to), but still has not yet developed the acting chops to appear as credible, especially in a film as emotion heavy as this. Much of the time, he cannot express what Crowe wants Baylor to express. Dunst is better, but again, comes across like Hudson-lite. There are two really good moments in the film. The first is when Sarandon has an extended monologue near the end of the movie, and the second is a series of scenes after Colburn helps Baylor to fulfill an old promise. This is where Crowe works his magic. The rest of the film, unfortunately, does not work as well. 2 hours, 3 minutes, Rated PG-13 for language and some sexual references.